If you or a loved one is dealing with heat loss, know that you’re likely in good shape to generate heat during a power outage if you have a wood-burning appliance and plenty of cord wood on hand. If you have a gas fireplace or insert with a standing pilot, it will light during a power outage since it doesn’t require electricity to activate the pilot flame. 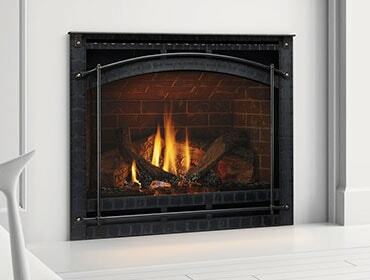 If your gas fireplace was manufactured in recent years, it may have an energy-saving intermittent pilot ignition system, which requires electricity to spark the pilot flame each time the fireplace is used. Many models, such as Heatilator gas fireplaces and gas inserts are outfitted with IntelliFire or IntelliFire Plus ignition systems, which have battery backup systems that can be used to light the pilot during a power outage. Generally, IntelliFire systems require two D cell batteries, and IntelliFire Plus systems require four AA batteries. If you have a wireless remote control, or a wall switch with a display, find the control box in the lower controls of the fireplace or behind the stove. There will be a switch that slides between ‘ON’, ‘OFF’ and ‘REMOTE’ – slide this to ‘ON’ for the appliance to operate with the power off. If you have questions, consult your owner’s manual or local hearth dealer. Remember that fireplaces and inserts make fire heat, so be sure no flammable objects are near them, and please keep children a safe distance away. If your hearth appliance has been exposed to water in any level, please contact your local dealer. For your safety, Hearth & Home Technologies products that have been partially or completely exposed to water, whether by flood, hurricane or leaks should not be used. Click here for warranty information.